Whether it’s to save money at the gas pump, reduce the impact on the environment, or get the solo ticket in the HOV lane inside the Beltway, people today are buying a lot of hybrid vehicles. If you knew you would spend billions of dollars on fuel each year, saving money with hybrid vehicles would have an even bigger impact on the bottom line. That’s one reason why the Navy is investing in hybrid power plants for its ships. For more reasons that just fuel savings, the Navy has a long-term goal of building completely integrated electric drives for new ships. But for ships in service today, the Navy is looking to hybrid-electric power plants on ships to save fuel costs. 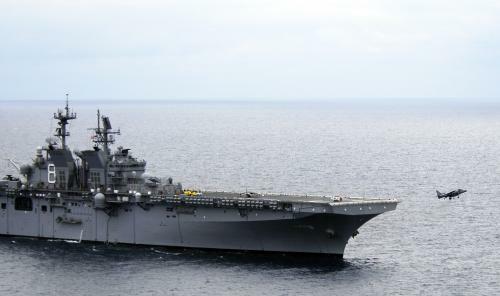 The USS Makin Island is the first Navy surface ship to be equipped with such a system. Makin Island uses gas turbine engines and an auxiliary propulsion system (APS). The APS uses induction-type electric motors to power the ship’s shaft and drive the ship for roughly 75 percent of the time underway. The demonstration does not stop with just one ship. Last summer, the Navy signed a contract with General Atomics and DRS Technologies to demonstrate the use of hybrid propulsion in the DDG-51 class destroyer in FY 2011. The Navy estimates it will cost $10 million to retrofit this system into each ship. Installing the hybrid electric drive system onto a DDG-51 class destroyer may reduce steaming costs by an estimated 16 percent and save approximately $2.5 million per year. Makin Island is already saving us money. When she made her trip from Mississippi around South America to San Diego last fall, she consumed 900,000 less gallons of fuel than what another ship of her class would have consumed on the same journey. That translated into about $2 million saved just in the transit to homeport. The benefits of hybrid drive propulsion on board Navy ships extend beyond the business case for saving money on fuel. It’s also about the mission. The operational impact of using less fuel at sea translates into more steaming days between underway replenishment. The added endurance allows ships to sail independently for longer periods of time and adds greater flexibility to expeditionary operations. Photo: An AV-8B Harrier assigned to Marine Attack Squadron (VMA) 311 takes off from the amphibious assault ship USS Makin Island (LHD 8). Harriers from VMA-311 became the first AV-8B aircraft to operate off the ship during combined combat system ship qualifications trials. Courtesy of Mass Communication Specialist 1st Class Douglas Bedford, U.S. Navy.